Marcus Rashford has revealed the five players who helped him inspire to making his remarkable breakthrough at Manchester United. When he first broke onto the scene under Louis van Gaal, the excitement was unreal and he did not seem a bit fazed by it all. Rashford took it all in his stride and has become one of Europe’s best young players. At 21, the England international has already become one of United’s most important players, especially since Ole Gunnar Solskjaer’s arrival with several stars looking rejuvenated under the Norwegian coach. His debut came in the Europa League against Midtjylaland when he scored a brace, only to follow it up the following weekend with another two goals against Arsenal, who were chasing for the Premier League title at the time. It has been an incredible few years for Rashford but there’s little time to sit back and reminisce. Now is the time to drive on, win silverware and become one of the club’s truly greatest players. 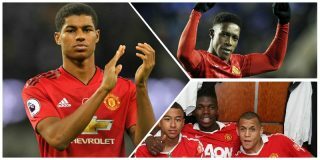 “I think seeing other academy players starting in the first team,” Rashford told GQ, as quoted by the Manchester Evening News. “When I was younger there was Macheda, Danny Welbeck, Ravel [Morrison], Pogba, Jesse – so they were getting in and around the first team. “I was about 14 or 15 at the time and being around those type of players that were in the first team at the time, that made me understand how realistic it was. “When you’re younger, you have this dream of becoming a top, top player, and mine was always to be at United. You get to 12, 13 a lot of your friends start to go different places, you start getting cut off. The likes of Mason Greenwood, Tahith Chong, Angel Gomes and James Garner can have the same impact on youth players now. They’re the ones selected to travel to and from games with the first team. The rest will want a taste of that and should put in extra work as a result. It’s essential to have belief booming in your academy. Faith in players and faith from players that they have what it takes to make it.